A Scottie gets a bath in one of the fountains at the Bercy Park. 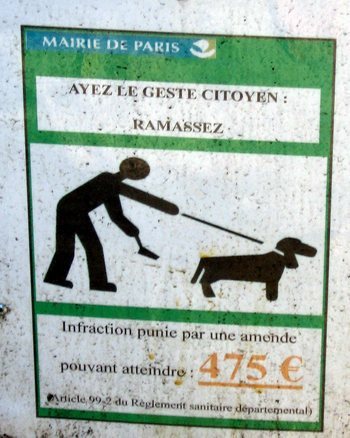 Dog poop still exits on the sidewalks of Paris in spite of stiff fines. 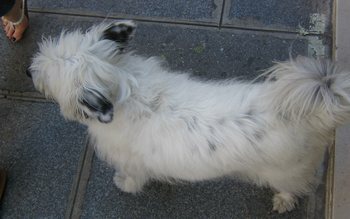 The situation is somewhat better, but some Parisian dog owners are recidivists. This cutie would never do anything so bad, would he? Well, I suppose the problem is really with the owner, whose foot is shown here. 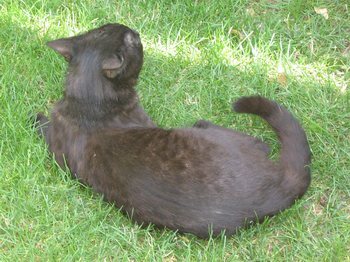 This lucky cat lives in the Luxembourg gardens, near the Luxembourg Palace where the French Senate meets. 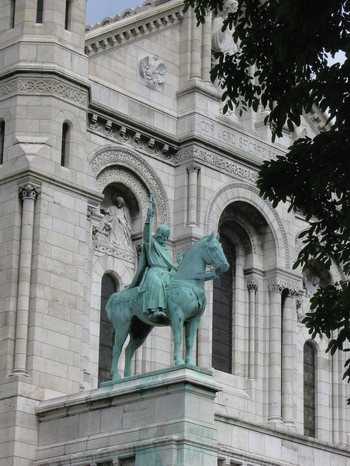 Horse in front of Sacre Coeur. 1. Get up early and go for an hour-long walk before the heat and air pollution worsen. 2. Open windows only at night and close them by 9 or 10 in the morning, at the latest. 3. Cover south facing French doors that have only flimsy curtains with heavy quilts or blankets during the day. 5. Be ready to take a cold shower at any time. 6. Drink lots of water. But do not drink too much. This year, with this canicule (that’s what the French call a heat wave), the problem for many older people has been that they drink too much water instead of too little. This depletes the body’s mineral salts and can cause dizziness and even fainting. 7. Venture out in the late evening for a moderate walk to an air conditioned restaurant. Do not dine until 9PM. 8. If you get cabin fever during the day and you must venture out, go to the grocery store and stand near the frozen food cases. 9. If you have a chronic health problem such as high blood pressure or a blood condition, take very seriously the problem of air pollution. The bad ozone that is cooked up in a city like Paris during a heat wave is detrimental to people with these problems (we learned the hard way in 03). Check the web site for AirParif daily. If it indicates that the air quality is bad, in particular with bad ozone, do stay indoors except for the morning and evening outings mentioned above. And keep windows closed all day long. The heat wave that we are experiencing this year is not as hot as the one we had here in August 2003. But it has been much longer lasting. Yesterday and the day before we had very bad air quality, so we stayed inside except for the morning and evening outings. We’ve had several other bad air days this month, too. The French have no trouble admitting that they’ve had a heat wave, but they are loathe to talk so much about the deadly air pollution problems. After dinner last night, we walked home in the rain. It felt glorious. It was a very cold, heavy rain, and water ran in the streets. There was much thunder and lighting, which absolutely delighted me (always does!). Today, finally, we have a cloudy day and the temperatures are much better – only in the 80s, not the 90s. The French climatologists have warned that this will not be our last heat wave. “Beginning in 2050, these canicules like that of 2003 will be relatively frequent,” according to climatologist Jean Jouzel (Le Parisien, July 26, 2006). The cause? The greenhouse effect caused by emissions of greenhouse gases. A chain reaction has been started, says Valerie Masson-Delmotte, a paleoclimatologist. Even if we stop the production of greenhouse gases, the climate is still going to heat up from now until the end of the century. So, what has changed here since the canicule of 2003? The weather phenomenon has been less violent. Nights have not been quite as hot. The government has put in place a Canicule Plan and has implemented the plan with great seriousness. One part of the plan in Paris is that there is a list of 13,000 or so people who are older and living alone, who receive a phone call each day of the canicule, from someone at the local town hall for the arrondissement. The purpose of the call is to remind the older person to drink enough water, etc., and to check in on him or her. One person who did not respond to her call was found dead that day. Some others have received help, like a home health aide for a day or two, or transportation to a hospital. One suburb of Paris, Saint-Fargeau-Ponthierry in Seine-et-Marne, has an air conditioned bus and an air conditioned salon. In the salon, they have games and performances to entertain old people from 2PM to 6PM, Monday through Friday. If a person older than 70 is feeling isolated, hot and bored during the canicule, she can call to make arrangements for the bus to pick her up, take her to the salon, and bring her home at the end of the afternoon, all for a mere euro, round-trip. What a great idea! Somehow the French government was able to gather up an additional 2 billion euros by making French people work on a day that they used to have for a holiday (the Pentacost). This money is dedicated to efforts to help the older people and handicapped people who suffer in a canicule. The organization that collects the funds is the Caisse Nationale de Solidarité pour l’Autonomie (CNSA). Only 500 million euros have been used so far. The big telecommunications centers operated by France Telecom are very hot places that are too big to be air conditioned. All the high-tech equipment needed for telecommunications these days puts out a great deal of heat. The poor folks who work there must endure temperatures around 100 degrees F. The management has changed their hours so that they start at 6AM and work until 1PM only, and they’ve rented big air conditioners that provide areas where workers can cool off. One of the big heat-producers are the bays required to provide ADSL service.